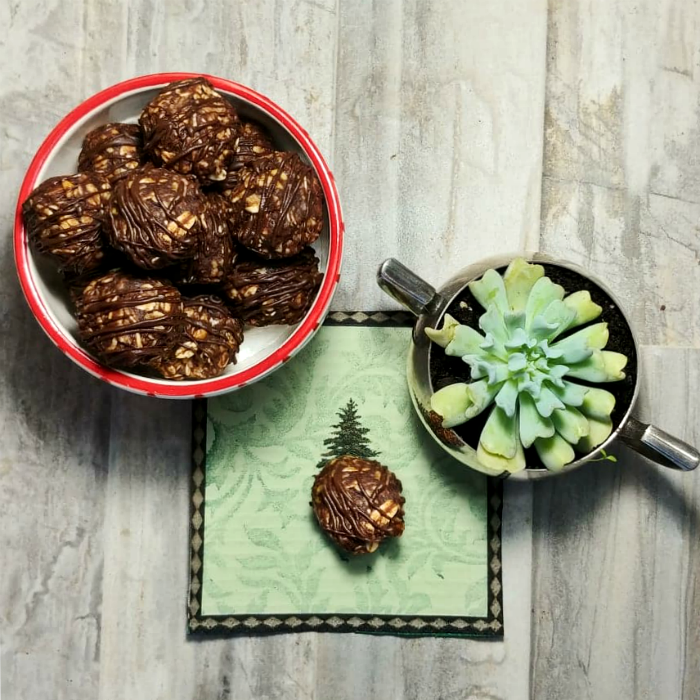 These no bake chocolate peanut butter energy bites are full of flavor and have only 3 WW Freestyle points in each bite. They are easy to make, low in sugar and have a rich creamy chocolate peanut butter taste. The prep time on these healthy chocolate energy balls is only 5 minutes or so which makes them perfect for this time of the year when there are so many things to do. Also perfect is the low calorie content. I don’t know about you, but having a snack with only 3 WW Freestyle points (and 88 calories!) that tastes like a decadent truffle is a win in my book. Energy balls are some of my favorite sweet treats. I love the portion control that is built right into the bite and most are around 100 calories or less. Try one of these recipes, too. 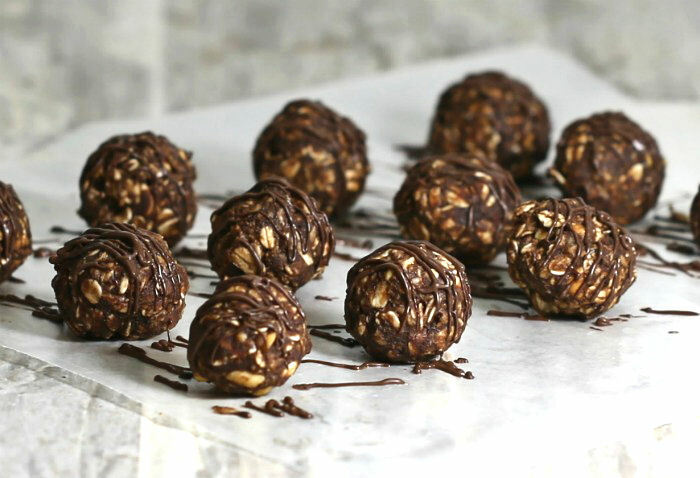 These delicious little peanut butter energy balls of goodness could not be easier to make. 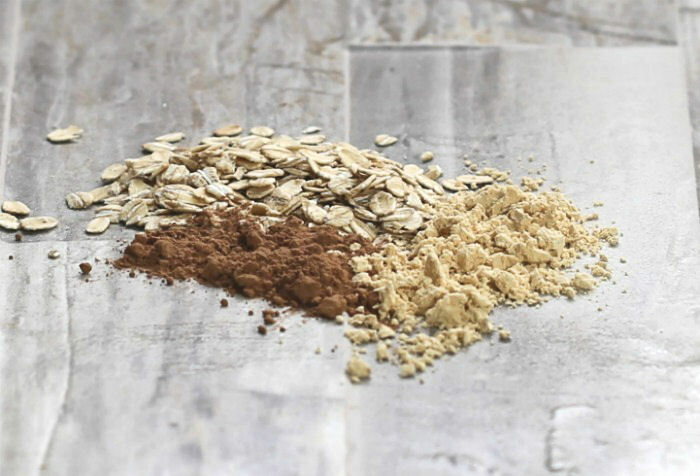 The base of the flavor of the bites comes from old fashioned oats, unsweetened cocoa and peanut butter, along with a special substitute that keeps the calories lower – PB2 powdered peanut butter. 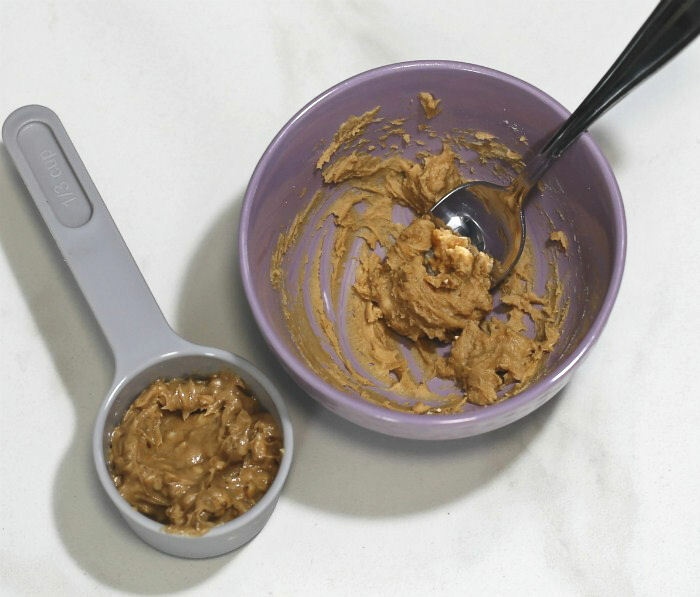 This amazing powder has had the oil removed from peanut butter to make a powder that has the consistency and tastes very much like peanut butter when it is mixed with water. Since it has only 50 calories for 2 tablespoons, (instead of 210 or so for peanut butter) this is a huge savings on calories. I also used chunky peanut butter, as well, but not as much as a normal recipe. The powder also comes in a chocolate peanut butter version as well. It could be substituted in this recipe for an extra boost of chocolate flavor. 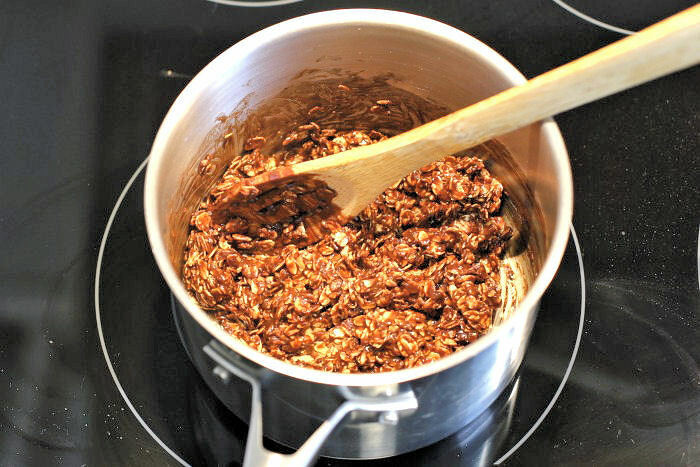 The milk, cocoa powder and sugar are combined in a saucepan until boiling, then removed and the peanut butter, PB2 mixture, rolled oats and canola oil get mixed in to making a thick chocolatey peanut butter mixture. 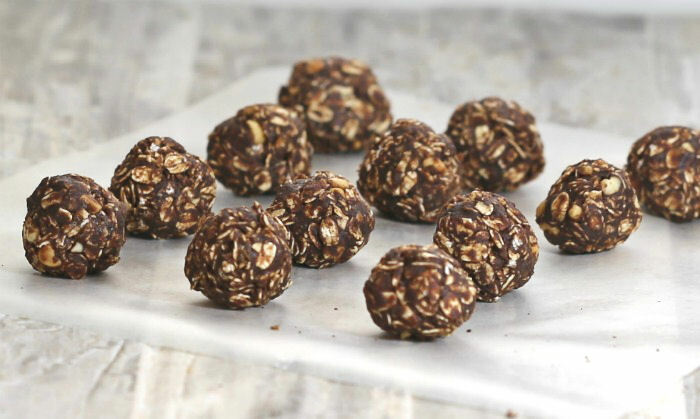 I normally make no bake energy bites into a ball shape right from the dough, but I changed my mind on this recipe. This mixture is messy and sticky. I found it much neater to drop it by spoonfuls on a baking sheet and then put it in the fridge to cool. This made it much easier and a heck of a lot tidier to make the balls. Back in the fridge they go while I melted some dark chocolate wafers. I only needed a few since I plan to just drizzle the balls with a tiny bit of chocolate. Enjoy Life chocolate chips will also work and are gluten free. The melted chocolate only adds 100 calories to the whole recipe but makes a world of difference to the taste of these energy bites. Say bye bye to protein bites – and hello to a truffles experience! 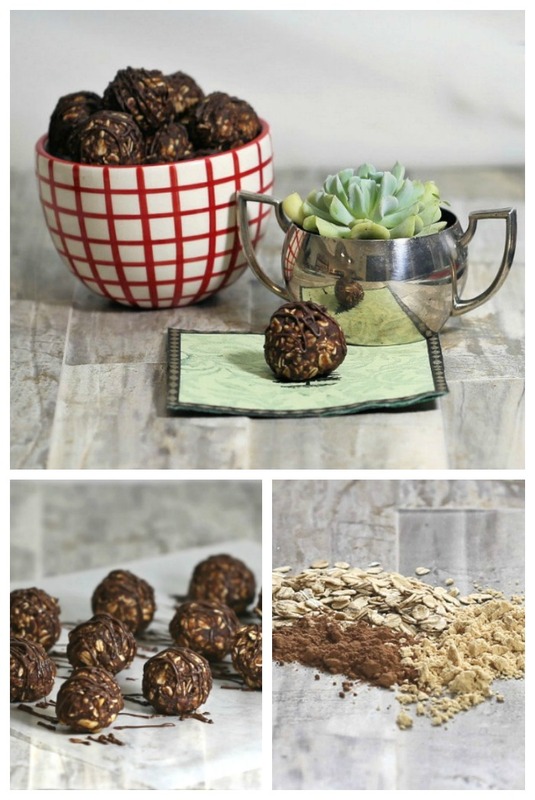 If you like the taste of dark chocolate with a hint of peanut butter, you will love this healthy energy balls recipe. The crunchy peanut butter gives a nice texture to the bite and the decadent chocolate drizzle is deep, dark and rich tasting. The bites are not overly sweet since the sugar content is very low but they are still quite rich. These yummy energy bites can find a place in most diet plans. They have only 88 calories, with 1.2 grams of saturated fat and only 4 grams of sugar in each bite. 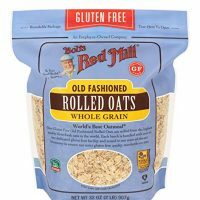 They are gluten free, low calorie and have only 3 WW Freestyle points. Enjoy them with a glass of almond milk as a snack or as a sweet bite after your meal. 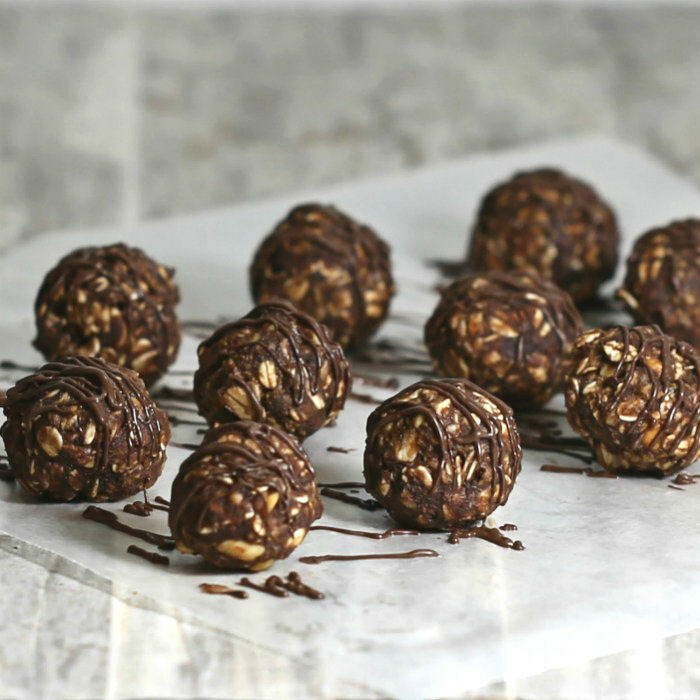 Would you like a reminder of these healthy chocolate peanut butter balls? Just pin this image to one of your healthy sweets boards on Pinterest. 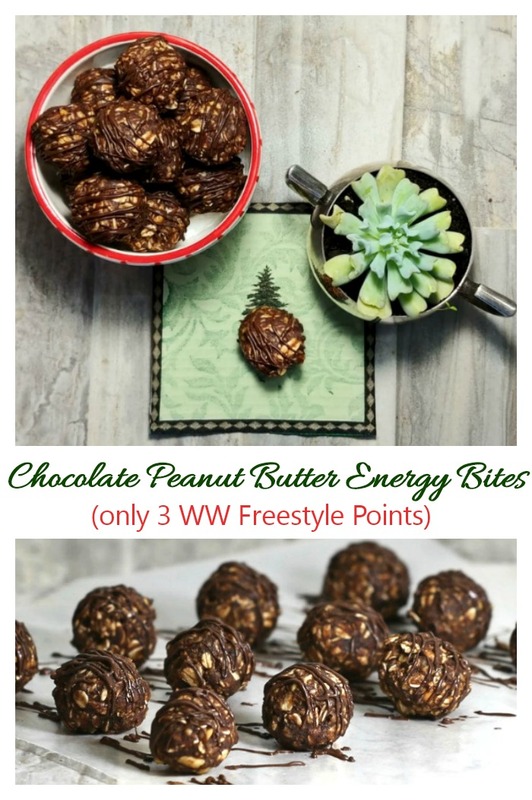 These chocolate peanut butter energy bites are packed with flavor and have only 3 WW Freestyle points in each bite. 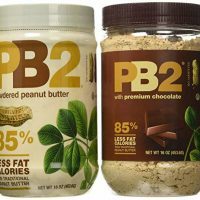 Combine the PB2 powder with water until a peanut butter mixture forms. Mix the milk, cocoa powder, and sugar in a saucepan over medium low heat. Bring to a boil and let the mixture boil for about 1 minute, stirring constantly. Add the PB2 mixture and peanut butter and stir in the oatmeal and canola oil. Working quickly, drop spoonfuls of the mixture on to a baking sheet lined with a silicone mat, wax paper or parchment paper. Place in the fridge to set for about 15 minutes. Roll each cookie shape into a ball. 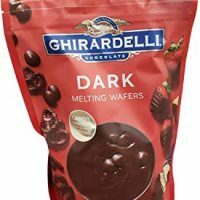 Place the dark melting wafers in the microwave and heat in 30 second increments until melted. Place in an icing bag and drizzle over the balls. Return to the fridge for about 10 minutes. You can make the balls right out of the saucepan, but it's messy. Making cookie shapes first and then allowing to set in the fridge for a while makes the process much less messy on your hands.